Originally uploaded by love life live love. 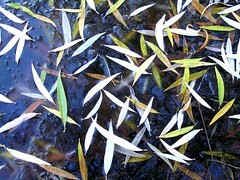 These are leaves from the weeping willow that is on one of the banks of the pond. This morning it had another crusty frost level over the top of this. I've never had the pleasure of watching something freeze over in nature so directly before. I'm finding it very cool.